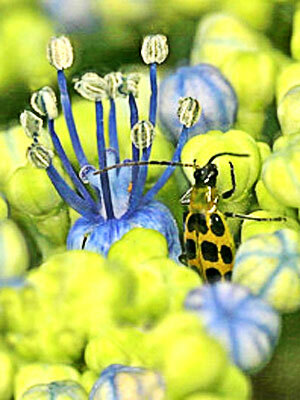 Botanical Insecticides (commonly referred to as ‘BI’s’) are derived from naturally occurring compounds found in plants. Widely used in the from the 1800’s to the 1940’s until the introduction of synthetic pesticides, they are once again gaining popularity. Botanicals are environmentally friendly. They break down rapidly, so there is less chance for any negative long-term effects. Most can be applied within one day of harvest. Because of their rapid degradation, it may be necessary to reapply them more frequently and to time applications more precisely. BI’s work quickly to stop insects from feeding, although death may not be immediate. This, coupled with rapid breakdown, means that BI’s can be less harmful to beneficial insects. There are many types of Botanicals available. Pyrethrum, one of the most common, is derived from the pyrethrum daisy. It can be used for fleas, flies and mosquitoes and is often combined with rotenone and ryania or copper for garden use. It is toxic to cats, bees and fish, so apply it judiciously. Ryania can be used against citrus thrips, European corn borers, corn ear worms and codling moths. However, it is very toxic to dogs. Try other Botanicals before resorting to Ryania. Sabadilla is derived from a lily that grows in Central and South America . It can control vegetable pests such as caterpillars, thrips, stink bugs, harlequin bugs and squash bugs. Sabadilla will kill some beneficial insects and since it is highly toxic to bees it should be applied at times when bee activity is low. It has also been known to cause severe allergic reactions in some humans. Rotenone, another Botanical that comes from South America , is effective against leaf-feeders such as aphids and beetles. Do not use near ponds or streams as it is toxic to fish. Also of concern is a recent finding that rotenone may be linked to Parkinson’s disease. Although research is not conclusive, use this product with caution. Neem extracts have both fungicidal and insecticidal properties. It not only repels insects, they disrupt the feeding and growth cycle. Another advantage is that neem can be absorbed by plants so that insects feeding after the initial application will be affected, too. In addition, it can be used to treat blackspot, powderly mildew and rust. Neem has just recently been added to the family of BI’s and is gaining in popularity because of its multiple uses and low toxicity. Insecticidal soaps are also included in the Botanicals category. They are derived from the salts of fatty acids found in plants. Insecticidal soaps are very effective against soft-bodied insects such as whiteflies, mealybugs and aphids. Direct contact with the insect must be made in order for it to work. Most Botanicals do not damage plants and are low in toxicity to pets and humans. Overall, BI’s are better for the environment and are safe if used according to the directions.